Although the main attraction of Punta Cana is its luxurious beaches and world-renowned golf courses, this tropical paradise offers plenty of activities and sights on land and at sea. The caressing sun will allow you to spend some idle days of pure sunbathing, whereas the most adventurous can look for an adrenaline-boost on a zip-line or by doing thrilling water-sports . Discover unspoiled nature and mingle with the locals, sample some flavored rum, experience the mild light of the sun rising, dance intensively and behold at the spectacle of this Caribbean gem. Going on an expedition in the Iguabonita Cave, zip-lining from the Farallon Cliff or discovering the renowned natural spring waters of Hoyo Hazul, or even heading to the natural theme park of Scape Park, are all options that offer a wide range of cultural and adventurous activities for everyone. Apart from having close encounters with parrots and monkeys, you can also simply enjoy the Caribbean sun and relax on the white sandy beach of Juanillo. Many options and different tours are available as well free transportation from most hotels of Punta Cana and some restaurants. If you want to pamper yourself on a well-deserved afternoon of relaxation, try the Ocean Spa. You will board a boat to spend an entire afternoon on, where you'll be able to take advantage of bio-pilates classes, a personalized massage and a fish pedicure. Fresh beverages and snacks are also provided. 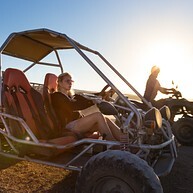 If you are looking for a new way to explore the landscapes of the Dominican Republic, how about trying to ride the dunes of Bavaro in an eco-friendly buggy across off-road paths. Along the 10-kilometer trail, you will have the chance to discover the beauty of the Dominican countryside, with its colorful vegetation and hill formations. A visit to the Fantasy Cave is included as well as a stop to try local coffee and chocolate. The tour ends with a visit to Bedrock city, caves characterized by stalactites and stalagmites. A guide will supervise small groups of people willing to experience the less traveled roads of the island. Tired of the beach? You can see the outback of Punta Cana aboard an open-air truck suited for tourists. The guides will give you insights into the traditional way of life in the Dominican Republic, but you will also have the opportunity to meet with locals in person, discover the cocoa and coffee farms, as well as rural schools. 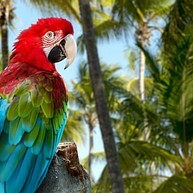 It will also be the occasion for you to sample cane sugar and delicious fresh fruit, as well as see wild animals. The tour will also stop at a shop that sells rum, cigars, cocoa... at local prices. It is the opportunity to learn more about the Dominican culture, history and customs while admiring the tropical countryside. Drinks and snacks are included and guests are picked up and dropped off at their hotels. As the name suggests, this tour introduces you to quirky local inhabitants - monkeys - but also grants insight into local lifestyles. You will first have the opportunity to learn how coconut oil is produced at the Casa del Coco, as well as try some local specialties like exotic fruit or roasted coffee. Then, you will have the time to admire and play with the friendly squirrel monkeys - the monkeys are harmless and often initiate contact with humans. On the way to meet them, the open truck will guide you through Higuey and offer you the chance to admire the mountain and a typical Dominican house. Drinks are included and guests are picked up and dropped off from their hotels. This company offers several marine tours for you to take time for yourself and relax aboard a luxury boat. You can choose between different activities such as Saona Dive and Snorkel, Punta Cana Scuba Diving, Catalina Island Adventure, Saona Speedboat and Catamaran. All the tours are well organized and the guides take care of the visitors with meals and drinks included. Pick-ups and drop-offs are made at your hotel. Among the numerous beaches that Punta Cana is famous for, Bávaro Beach is probably one of the most popular ones for tourists who come to sunbathe on deck chairs or take a dip in the turquoise blue sea. If you don't feel like spending all day at the beach, you still have a variety of activities at your disposal: from entertainment at casinos and watching live shows, to water activities like scuba diving, snorkeling or sailing. Lifeguards will be there to ensure security. 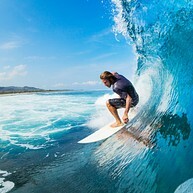 The Macao beach is probably the best spot of the Dominican Republic to surf. Whether you are a beginner who always dreamed of experiencing surfing or you have advanced skills in riding the waves, everyone is welcome reagrdless. In small groups, the instructors will help you master proper technique, first on the beach for the less advanced ones, and then directly in the water. There is a possibility to have the lessons taught in Spanish, English, Russian or Italian. Drinks and snacks are provided. 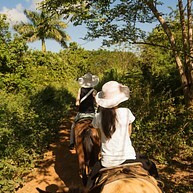 If you are looking for a different way to explore the lush vegetation of the Dominican Republic, consider riding a horse and discovering the outback of the island. On your way, a stop will be made for you to learn more about the local cultural life by tasting some fresh cocoa and trying your hand at rolling your own cigars. 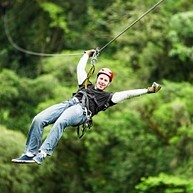 You'll have a choice of several different tours but you will always finish your ride with a zip line across the forest. 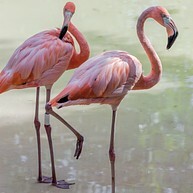 Indigenous Eyes Ecological Park is a private protected area owned and operated by Puntacana Ecological Foundation. About 1,500 acres of reserve await you in this tropical wonderland. Explore the several lagoons in the shape of an eye and take a dip in some of them. After, pay a visit to the zoo or the iguana habitat to have a complete experience of the fauna and the flora of the Dominican Republic. 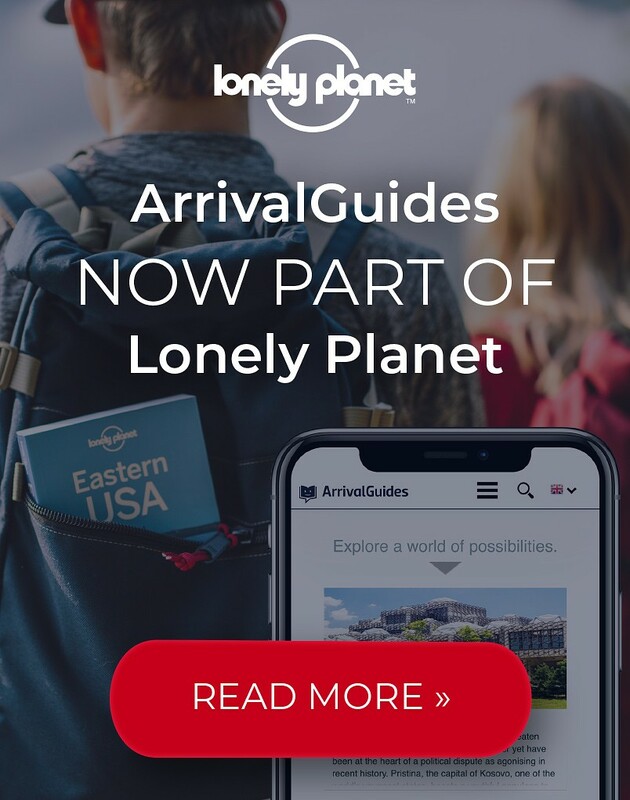 There is a possibility to visit with a guide or independently. The Isla Catalina is just a ferry ride away from Dominican Republic’s mainland, providing a personal luxury getaway or a diving or snorkeling trip to some of the best reefs of the region. Away from the bustling sites of Punta Cana and La Romana, it is the ideal spot to enjoy the beautiful sandy beaches for those in search of peace. Besides the idyllic settings of clear blue waters and white sandy beaches, the Dominican Republic is also renowned for its golf courses. One of the more popular ones is the Punta Blanca Golf Club, designed by the famous player and golf course designer Nick Price. You have the opportunity to work your swing among luxuriant vegetation, natural wetland areas, lakes and rolling hills. Drinks and snacks are included. Punta Cana offers great fishing opportunities with over seven months of bill fish season. 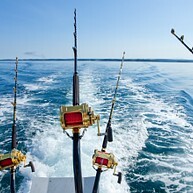 Fishing off the East Coast is regarded as one of the top five of the world’s best bill-fish areas. Blue marlin and sailfish are among some of the fish that you can expect to catch. The Marina is also a famous spot for fishing tournaments and has become a popular destination among those who enjoy fishing and breaking records. Among all the different fishing charters and tours in the Marina Bay, Mike's Marina Fishing Charters offers a large choice of boats for shared or private fishing charters as well as participation in national and international sport fishing tournaments. 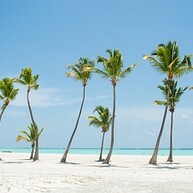 The long stretch of sandy coastline is Punta Cana's claim to fame. Powdery white sand is fringed by coquettish coconut palms. Located away from the popular Bavaro, Playa Juanillo has kept its original allure, and much of it still appears to be untouched by man. In a calm and low-key location, with its only one restaurant, it's the perfect place for relaxing on the sunbeds while admiring the sunset. Swimming with dolphins is a dream for many looking to share an intense moment of tenderness with the animals. Here at Dolphin Island you will also have the possibility to interact with other animals such as sea lions, sharks and stingrays and make this moment an unforgettable and unique one. Different activities are proposed in order for you to come close to these amazing aquatic animals in their natural habitat. Snorkeling with sharks and jet boat rides are also offered during the tours. The Manatí Park Bavaro theme park offers a getaway for the whole family, invited to discover and learn more about the Caribbean fauna and flora. The largest animal collection of the country hosts more than 150 species of animals and plants and visitors will even have the opportunity to come into close contact with some of them, suh as parrots, iguanas or dolphins. Four animal shows are performed daily as well as a ritual show of the ancestral Taino culture, a step into Dominican history and traditions.